One of Europe’s liveliest annual street parties, Festa da São João do Porto (Festival of São Jão), took place yesterday and ended today in Porto, Portugal, with it’s traditional attractions of outdoor music, dancing, festive food and drink delights and fireworks by the river entertaining the thousands of visitors who attended. Porto was not listed on our earlier post this year outlining some of the destinations to travels to in 2015, but having recently returned from there, it should have been! The city has plenty to offer a discerning traveller with it’s historical sights, colourful buildings, cultural activities and gastronomic experience. The focal point of Porto is the Dom Luis I bridge and the banks of the river Douro which provide a hive of activity and entertainment. 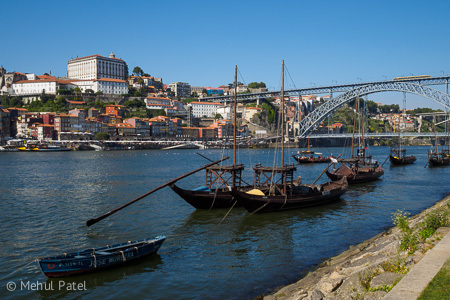 The top tier of the 19th century steel arched bridge provides a scenic overview of the historical part of Porto and the river Douro as it heads both inland and out to the Atlantic Ocean. 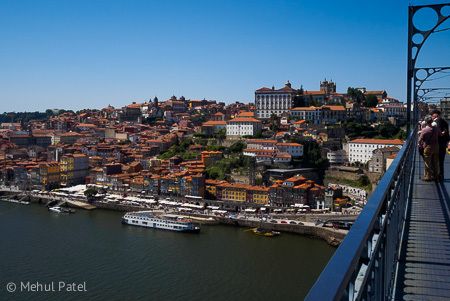 View of the historic old town of Porto from the Dom Luis I bridge – Porto, Portugal. 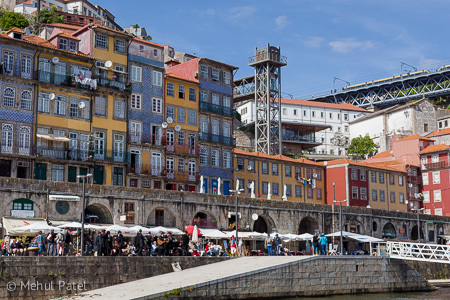 The historic old town of Porto has been declared by UNESCO as a world heritage site. Porto is probably most famous for its production of port wine and visitors have ample opportunities to sample and taste the various tipples on offer at bars, restaurants and directly via the producers who run tours of their cellars in the district of Vila Nova de Gaia on the south bank of the river Douro opposite the main city of Porto. Some of the producers also run cruises in traditional wooden boats to the Douro Valley along the river to see where the port wine comes from. Old style wooden boats (Rabelos) moored on the river Douro by Cais de Gaia overlooking the the historic part of Porto, Ribeira and the Ponte Luis I, Portugal. Rabelos are typical vessels of the Douro River which once traditionally carried barrels of Port wine from where the vineyards are located to Vila Nova de Gaia – Porto, where the wine was stored and then distributed. Other principal sites of interest in Porto include the old and the new, the new modern design building of Casa de Música where concerts and cultural events take place and the Bolhão market, a traditional and old looking market which sells local produce from dried cod fish to meats, sweets and of course wine. Side view exterior of the Casa de Música building – Porto, Portugal. The Casa de Música is a uniquely designed and engineered concert hall and cultural venue in Porto. 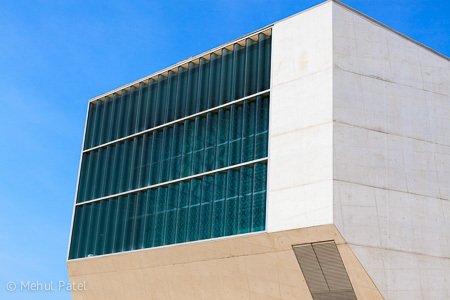 It was designed by the Dutch architect Rem Koolhaas and was opened by the Portuguese President on 15 April 2005. Colourful exterior of delicatessen, A Pérola do Bolhão – Porto, Portugal. 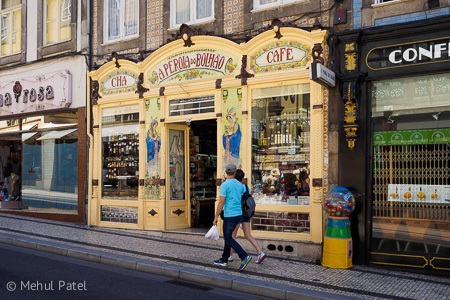 The local grocery store is situated on Rua Formosa in downtown Porto in the district of Bolhão by the market. It stocks local Portuguese produce including wine, cheese, meats, sweets and dried cod (hanging by the door in the image). To see more sights and attractions of Porto, visit our stock image library and browse the ‘Europe’ collection or type ‘Porto’ in the search field. Images located there can also be downloaded, purchased and licensed for use with prints also available for non-editorial only images. Below is a brief timelapse video, captured with the Olympus OM-D EM-1 camera, which illustrates life by the Dom Luis I bridge and the banks of the river Douro in Porto. To see the video in HD, click on ‘HD’ on the video player interface and it will take you to vimeo.com. In the second part of our technology trends feature with the founder of Digital Link, Bhavik Patel, we get his take on the popular gifts and gadgets for christmas and an idea of his vision for the future of home entertainment. What will be the gadget to have for now and the future? With gadgets and gift ideas the rage ahead of the christmas period we spoke to the founder of Digital Link, home entertainment and audio visual specialists in the UK, about new technologies, gadgets and gift ideas for this festive season. This week in the first part of two videos we look at the arrival of 4K TVs (also known as ultra HD TVs) this year and outline some of the current content available to view in 4K resolution and the potential drivers for adoption of this relatively new technology.